You have come to the right place to read about the 2017 Chrysler Pacifica, a wonderful minivan bound to meet your needs. The Chrysler Pacifica is an all-new vehicle for the 2017 model year, and was named after an SUV that Chrysler had manufactured for five model years. 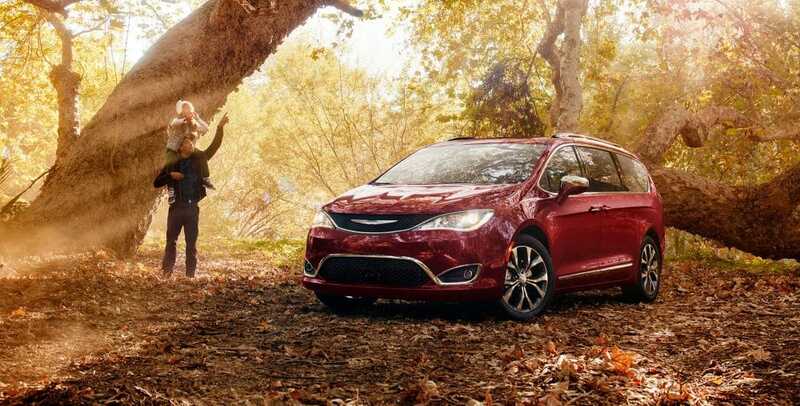 If you are looking for a minivan with a twist, then you could be very happy with the 2017 Pacifica. 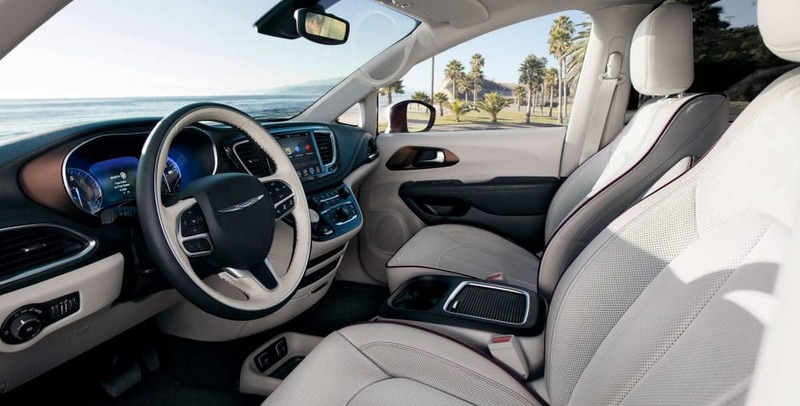 Keep reading to learn more about the wonderful 2017 Chrysler Pacifica, due to be available for purchase this spring. The 2017 Chrysler Pacifica uses an award-winning Pentastar 3.6-liter V-6 engine that offers up to 262 lb-ft of torque and 287 horsepower. The engine will also provide innovative weight-reduction strategies, cooled exhaust-gas recirculation (EGR) and two-step variable-valve lift (VVL). A standard feature of the 2017 Pacifica is engine stop-start (ESS) technology (late availability). The minivan is a front-wheel drive vehicle and offers a nine-speed automatic transmission. Feel free to use regular, unleaded gas to power the minivan. You can use cruise control to easily get to your destination on highways and similar, straight roads. There is an available hybrid model for the 2017 Pacifica, which uses a 3.6-liter V6 engine and offers up to 248 horsepower and an electrically variable transmission (EVT). This is a wide vehicle to allow occupants to have plenty of space for themselves and their belongings. In fact, up to seven or eight people can fit inside. It is also low to the ground to make it easy to get into, and has hands-free sliding doors. Its exterior has sophisticated and sleek lines for a luxurious appearance. The vehicle's front passengers can make use of an 8.4-inch touchscreen to control smartphone app functions, navigation and audio. 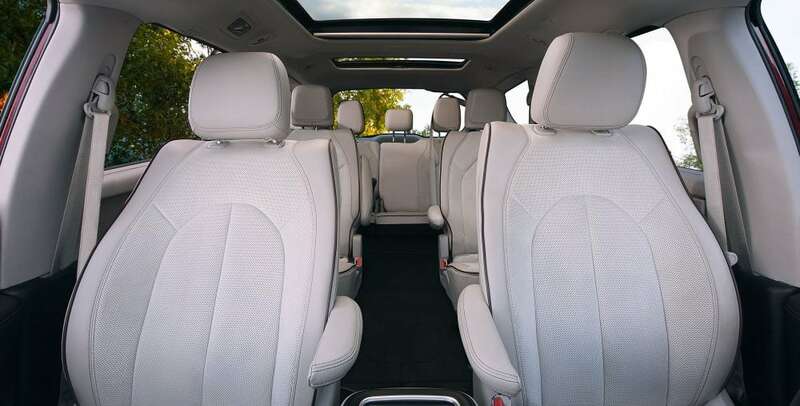 Rear passengers will have a Uconnect Theater System that will give them dual ten-inch HD touchscreens for watching movies, connecting personal devices to stream content and playing built-in games. The 2017 Pacifica offers a Stow 'n Go seating system with seats that can be folded into the floor. The minivan's hybrid version offers removable captain's chairs. A hands-free liftgate may be opened or closed by swiping your foot underneath the bumper or doors. Is it possible to get the 2017 Pacifica with a panoramic sunroof? Yes, you can get the minivan with that if you so choose. How many exterior paint colors are available for the 2017 Pacifica? Ten different exterior paint colors are available for the minivan. If you are seeking a vehicle that has all the latest security and safety technology features, then the 2017 Pacifica is a good bet because it offers more than one hundred of them. The vehicle's Surround View camera used four cameras that are placed on different locations of the vehicle to give a driver 360-degree views to include a bird's eye perspective of the minivan and surroundings. The minivan's LaneSense Lane Departure Warning-Plus controls power steering by providing a torque input to inform and help a driver with corrective action. Forward Collision Warning-Plus puts on the brakes to alert a driver if an accident appears to be unavoidable, and helps the driver respond. The above-mentioned cruise control is adaptive to keep a safe distance between you and the vehicle ahead of you. We would like you to come check out the 2017 Chrysler Pacifica today and see how it could be for you! We look forward to assisting with your vehicle search!